Five-reel nine-payline Silver Bullet slot from Playtech brings you back to the Wild West, with its symbols creating a unique atmosphere. 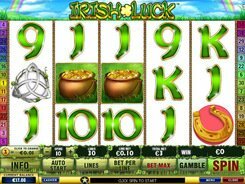 On the reels, you will come across a horse, sheriff’s badge, horseshoe, Colt revolver, wagon wheel, pipe, and whiskey bottle – all living up to the slot theme. The minimum coin value is $0.01, and the maximum coin value is $5. 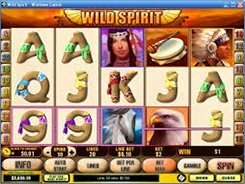 The highest win in Silver Bullet slot is 10,000 coins awarded for five Barrel icons on a selected payline. The Sheriff’s Badge icon is the wild symbol replacing other regular symbols to create winning combinations. Another paying symbol is the Colt Revolver. 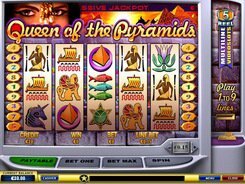 Two to five icons scattered anywhere bring a win of 1, 5, 10 or 100 times your total bet. 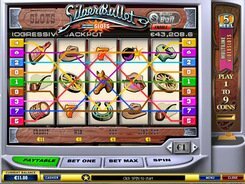 As many other Playtech-powered slot machines, Silver Bullet is linked to an exclusive Dollar Ball progressive jackpot system. This is an optional feature and it should be activated by pressing the Dollar Ball button at the top right corner and then placing a 1-dollar bet. You should select 5 out of 49 numbers. 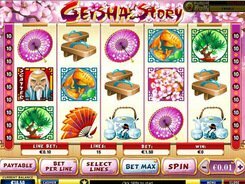 Then, in the main game spins the machine will randomly draw five numbers, and if they match those that you have picked, you get a progressive jackpot. 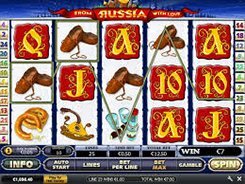 If only four numbers match, you receive the second-largest jackpot worth 1 percent of the jackpot pool. PLAY FOR REAL MONEY!